The term `lama', meaning `guru' or master in Tibetan, used to be the tittle reserved solely for high-ranking or accomplished Tibetan Buddhist monk, ordinary monks were merely `drapas'. Later, as `lama' came to be used as a polite form od address for any `drapa', it became a common misnomer for all Tibetan monks. Monk students of exoteric and esoteric Buddhism. Called `bachogwa' (scholars) in Tibetan, these monks, as discussed in the next section, are prospective holders of the top degrees of monastic study, and stand an excellent chance of becoming candidates for the position of monk officials. They represent "the best hope" of all monks but not all of them can hope to fulfill this intention. Monks trained in religious professions. These are monks who hire themselves out to pray for the safety and the happiness of their clients; to conduct religious ceremonies to release the dead from their sins, or as oracle consultants. Sometimes they pray on the street. Artisans and specialized practitioners. This category includes sculptors, molders and casters of images, painters, wood-block carvers and printers of Buddhist texts, and doctors. Monk laborers. These ordinary monks who perform various chores and duties about the monastery make up the majority of the clergy. 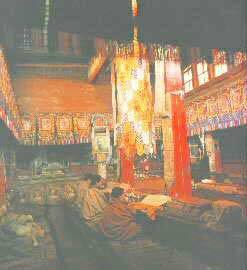 A praying hall of a dratsang. The government of a Tibetan Monastery may be described as a pyramid organized into three levels. At the lowest level the general monk population is divided into groups called `khangchens'(or `michens'). Monks are organized into `khangchens' by their place of origin. Each `khangchen' consists of about 100 monks, with the one topmost in seniority serving as the `jigen' or leader. An executive committee within the `khangchen' handles the day-to-day affairs. The level above the `khangchen' is the `dratsang' or school (it is more fashionable to call it `University'). Usually formed by several `khangchens', each `dratsang' is run more or less independently. Resembling a monastery within a monastery, each has its own prayer hall, library and monks, and possesses its own land, pastures and housing. However, `dratsangs' differ from each other in size and wealth. Some of them are so small that they have no `khangchen' under them. Some `dratsangs' are schools of exoteric Buddhism, and some of esoteric or tantric Buddhism. One of the smallest `dratsangs' is `Kala (time) Wheel' `dratsang' which offer courses in astronomy and the making of the calendar. It usually takes students from tulku/living Buddha and retired or acting `khenpos', and enjoys a much higher status than any other `dratsang'. Each `dratsang' is headed by a `khenpo'. Appointed by the local Tibetan government or its `superior monastery' (see below), the `khenpo' must be an eminent monk scholar holding the degree of `geshi'. A `khenpo' serves three-year (or six year) term of office as the chief administrator and the religious and financial officer of a `dratsang'. Under `khenpo', the chief official is the `lhazang chanzod' who. with his assistants, manages the `dratsang's' assets, liaison, and the reception of alms-givers. A `gesko', commonly known as the iron-club lama, is responsible for maintaining the monastic discipline, meting out punishment to offenders and resolving disputes among monks. In Lhasa, the `geskos' from the three great monasteries will take over the city during the `Great Prayer's Festival (smom lam)'. These officers and the `budsad' who leads the chanting of sutras, and the `shunglapa' who is in charge of monastic study, debates, and degree-qualifying examinations form the hierarchy of the `dratsang'. At the top of the pyramid a group called the `laji' oversees the entire monastery. This committee includes all `dratsang khenpos' and is presided over by the Abbot. Under the `laji' are several monk officials who manage the monastery's manors, property (for instance, Sera Monastery owns three counties nearby, and the huge land of Mongolian 39 tribes in the Northern Xizang (Tibet) which in 1914 after the collapse of Qing Dynasty are conquered by the Xizang (Tibet) government with two brigade soldiers) and financial affairs. At this level there are also several iron-club lamas in charge of discipline throughout the monastery and another `budsad' who leads sutra chanting at plenary assemblies. Usually, only adult males become students. However, sometimes, young boys joint the monasteries. For the first year the novice supports himself as he studies in a preparatory class at a `dratsang' of exoteric Buddhism. Study begins with the Tibetan alphabet and moves on to the common prayers. After passing examinations at the end of the first year he qualifies as a regular student for the study of esoteric Buddhism. Still lying before him is an extended period of studying lasting from ten to twenty years, during which time he is expected to master in thirteen successive stages five Buddhist scriptures: the Hetuvidya, the Prajna, the Pranyamula-sastra-tika, the Sila and Vinaya and Abhidharma-kosa-sastra. Upon completing these courses and with the recommendation of his tutor and the approval of the monastery's authorities, the student monk may apply to take qualifying tests, given either in the form of debate or oral test, for `geshi' degree. Very few monks pass the tests. The degree of `geshi' qualifies a holder for the position of `khenpo', and to continue his study at a higher level in the `dratsang' of esoteric Buddism. As a rule, the tulkus/living Buddhas hold the `geshi' degrees. The degree system is similar to Han people's three levels degree system. The long climb up the ladder of esoteric Buddism is an arduous process lasting up to several decades. Not surprisingly many monks find it impossible to complete the journey and have to drop out. Monasteries in Xizang (Tibet) are separated into major monasteries and lesser monasteries. Some major monasteries has hundreds lesser monasteries affiliated with them. The lesser monasteries sometimes are built by missionary monks from the major monasteries, they sometimes are monasteries of a different branch originally, and are forced into subordination after a religious warfare. Occasionally, the monks from the Abbot down are willing to fight to the last one for their particular sect. There are about 500 tulkus/living Buddhas in Xizang (Tibet). In some monasteries, there are several tulkus. The lineage usually starts by some legend or a decree of the Emperor or King. The reincarnation of a tulku/living Buddha was originally determined by oracles, and later, by a royal decree, determined by the Lottery System. Sometimes, the Emperor or local Tibetan government prohibits the continuation of some lineages. For instance, the lineage of tulku Radreng is a good example. The monastery Radreng was built in 1056 as the Principal Monastery of Ka-dams-pa (Old Yellow Hat sect). Late it became a monastery of Ge-lug pa (Yellow Hat sect). In 1862, Radreng was the regent of Xizang (Tibet) and was accused taking bribery by his political oponents. Losing the struggle, he run to the central government in Beijing with the seal of the regent. The central government judged him guilty, terminated the lineage of tulku Radreng (i.e., prohibit him to reincarnate), and gave the Radreng Monastery to Dalai Lama. After his passage in 1863, the central government reversed herself in 1877, and proclaimed him innocent, reestablished the lineage of Radreng, restored the Radreng Monastery to the control of the reincarnation of that lineage. Later the Tibetan government terminated Radreng lineage in 1947 after the new Radreng was forced to resign from his regentship and after further political warfare. Copyright © Axachinaregion.com All right reserved. Site Designed by IatDesign.com Limited.